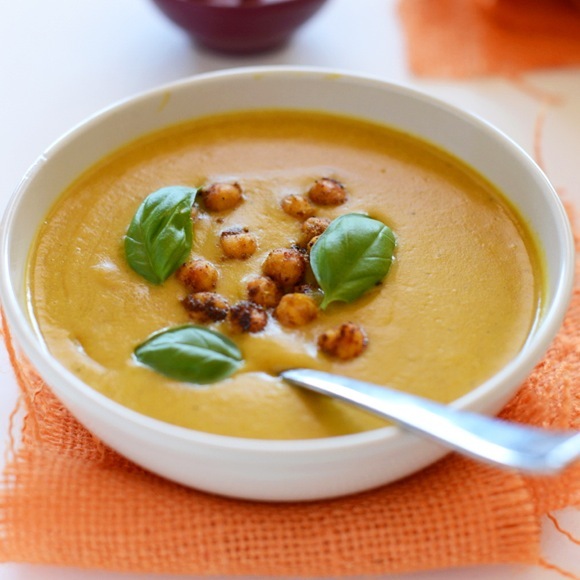 A sweet and spicy soup with sweet potato, coconut milk, and yellow curry powder. Plenty creamy with a slight crunch and heartiness from spicy baked chickpeas. Then start the soup by sweating the onions in a large pot over medium heat in 1/2 Tbsp coconut (or olive/avocado) oil (amount as original recipe is written // adjust if altering batch size). Cook for a few minutes and then add garlic and stir. Season with 1/4 tsp each salt and pepper and stir (amount salt/pepper as original recipe is written // adjust if altering batch size). Add sweet potatoes, curry powder, chipotle (or cayenne) and stir. Cook for 5 minutes, stirring frequently. Add 1/4 tsp more salt and pepper and the coconut milk (amount salt/pepper as original recipe is written // adjust if altering batch size). Then cover. In the meantime, prep your chickpeas by tossing them in olive oil and spices and spreading evenly on a baking sheet. Bake for 25-30 minutes or until crispy on the outside and slightly soft on the inside. Remove and set aside for serving. At the end of 25 minutes, taste and adjust seasonings as needed. I added about 1/4 tsp more salt and a pinch more chipotle (amounts as original recipe is written // adjust if altering batch size). Then puree using an immersion blender, food processor or blender. Transfer back to the pot if needed and keep heat on low until ready to serve. Will keep in the fridge for several days and the freezer for a month or so. *I amended the cayenne/chipotle to include just 1/4 tsp instead of 1/2 tsp. I prefer spicy but recognize that some people prefer it more mild. Adjust this amount as you see fit.